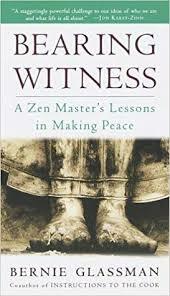 In honor of Zen Peacemaker Founder Bernie Glassman Roshi who died recently, Bread Loaf Mountain Zen Community will dedicate our winter study group to his book, Bearing Witness: A Zen Master’s Lessons in Peacemaking. In it Bernie offers powerful teaching stories that illustrate ways of making peace one moment at a time, no matter how difficult things appear to be. Out of these stories come the three tenets of the Zen Peacemakers Order: letting go of fixed ideas, bearing witness to whatever is taking place with us and right before our eyes, and taking action that heals ourselves and others. As peacemaker practitioners Bearing Witness is a central practice leading us toward making peace within ourselves, families, workplaces and communities as well as in those places that have been abandoned, forgotten and left behind. Our class will be offered both in-person and online (via the video conference platform, Zoom) at Bread Loaf Mountain Zen Community, and will last for five weeks, from February 5 to March 5. We will meet each Tuesday morning at 10:30 Eastern Time. The book is in five sections and we will discuss one section each week. The book is only available in a kindle edition or second hand. The class is free and open to anyone. Please consider supporting the work of BLMZC with a suggested donation of $50 for the course. All donations are greatly appreciated. Information about making your donation you find here. Registration is needed for this so we can send you information about our class. Please register by filling our this form.